Day 200 in Beijing: Not in Beijing. 200 Days in Beijing. And Shanghai. And San Francisco. And Healdsburg. And Johor Bahru. And Kuala Lumpur . And Sinagpore. It should be day 200 in Beijing for me. Little did I think when I started this blog that I’d even be doing a daily blog that would take me all the places I’ve been to as of today. A bit of history: I used to have a blog, a few years ago, where I posted things about my views on life, love and therapy. I decided that it probably wasn’t the best thing to do since I wasn’t sure I wanted my personal life out there. However, when I started getting ready to move to Beijing, I decided to do a 14 day countdown for my friends and family that wanted to keep in touch. When I arrived here I found that I enjoyed it so much I’d attempt to do a blog post for each and every single day of my 3 year contract at my job. I may stay longer than 3 years but that was my minimum and that is where I wanted to start. I’m now at 200 days and surprised at how easy it has been to think of something new, and different, each day. There have been a few tough times where I felt I was losing steam but I asked my readers to give me suggestions and it brought me back to life. I would like my readers to comment more and tell me what they like and what they want to know as that does excite me and I have more of an idea that people are actually reading my blog. I would like to think people are reading it and enjoying it but I won’t know unless they tell me. So, I appreciate, deeply, everyone that writes to me and comments. It honestly makes me smile each time. In honor of that, I think Steve Johnson needs a shout out, as we say in the states. Steve is an old high school friend of mine and has been a one man cheer team for me and my blog. I think he has “liked” every single post and commented on most of them. Steve, thank you. I’m honored and humbled to be your friend and someone that you feel deserves being read. Day 191 in Beijing: Five Things I’ve Gained By Being In Beijing. I just posted about the five things I miss being in Beijing and I thought it would only be fair to look at the five things I’ve gained living here. 1. Seeing my brother, Robert and his family, whenever I want to see them: My brother has lived in Beijing for 6 years now. He has his own blog: A Man Called Su, which I suggest everyone check out and subscribe to as he has a different take on China than I do and he is also an amazing photographer. He is married to a wonderful woman and they just had a baby about 2 months ago. We actually live in the same apartment complex so we can visit whenever we want and go for walks together. Since we’ve been living in different countries for the past 6 years, it is a big benefit and reason why I moved to Beijing in the first place. 2. Living on the wild side: I had been living a pretty mundane life, in my humble opinion, for the last 5 years or so. I had received my Master’s Degree in psychology and started working. On a salary that averaged 43,000 USD a year, during that time, I paid off 65,000 USD in student loans by being extremely frugal. All while living in San Francisco. Not an easy feat! I didn’t travel or buy a new car or spend money on myself other than what were the basic necessities. I’m proud of what I did and how I accomplished this feat because it was hard work and I wanted to be debt free as quickly as possible. I did it, exactly, 6 years to the day that I took the out the original loans. However, I wanted to break out of my shell and see a different part of the world. I was going to quit my job and travel down to South America first, then Cuba because I love the culture and salsa dancing, and then to Europe and over to China. It seems I have gone the other way at this point and that is wonderful. I have now seen the Great Wall, The Summer Palace, The Temple of Heaven, The Forbidden City, not to mention Shanghai, Singapore and Malaysia. Oh, and I was able to stand on top of an oil rig in the the Pacific Ocean. Yeah, that was pretty cool. I now get to live on the very wild side and experience a culture, people, place and life that I never would have thought was possible. 3. Jill: I met Jill eight days before I moved to China. We were both at the SF Caranval parade and waiting for it to start. I was also waiting for my dear friend, and ex-coworker, Jon-David. Jill and I started talking as she was getting information for her website and business, San Francisco Tourism Tips, and needed pictures for her page on the SF Carnval for next year. After an hour or so, Jon-David showed up and we all had a great time hanging out. All three of us went to lunch, I asked Jill out for a date the next day, and we spent the next 8 days together and she saw me off at the airport. We talked on the skype every and, within 2 weeks, she had booked a ticket to Beijing. On July 31st, she arrived. 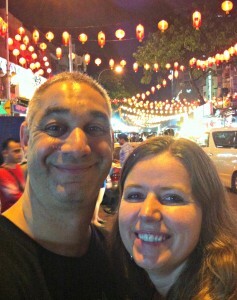 Things have been truly wonderful and being able to experience Asia with her has made it so much easier and enjoyable. We just celebrated our 6 month anniversary and, as far as I’m concerned, If you can travel with someone, it says a lot about the strength of a relationship. 4. The understanding, once again, that what I believe is a fallacy. My preconceived morals, values, ethics, are malleable and fluid. There are some things that I “believe” are the truth but it is not universal and each culture has a different take on how things should be done, what should be believed and how creatures should be treated. I come from my own ethical viewpoint but I love being challenged and having to figure out why, and how, I came to this belief and if it is actually fair. I work as a Behavioral Therapist and that is one of my core beliefs: What is right for me, may not be right for anyone else. We all make our own choices and have to suffer the consequences for those choices. It is up to you to decide and choose your path. If you don’t choose, you have still made a choice. 5. My new friends: This includes the wonderful Chinese nationals I’ve met and the expatriates. I feel as if I need to push myself more to hang out with more Chinese nationals and that is on the schedule since my work often has get-togethers and sporting events that I can go to and it is so easy to do that. Everyone that I have interactions with, including the guards at my apartment who always say, “Ni hao!” or “Hi!” to me and smile widely when I walk by, to the cabbies who laugh at my horrible pronunciation and say a word or two of English to me, it has been wonderful. I can not say enough about the kindness, elegance, and generosity of my coworkers, both expatriate and Chinese nationals. They are truly incredible and wonderful people who go out of their way. As for the expatriates I’ve met in Asia, it is almost like an immediate second family. We are usually the oldest of the crowd, with Jill and me being in our 40s, but it doesn’t matter. We are both very young at heart and so we end up with friends that are in their 20s and 30s. We love to hang out, have fun, and try new things. We have friends from all over the world and continue to build connections and share with each other. If I had not come to China, this would not have happened and I wouldn’t feel like I was as much of a world citizen as I do now. I love feeling like I’m growing, moving, changing and learning more about myself, other people and the world. It is what I strive to do for the rest of my life. The road not taken is the road I actually decided to take. Day 180 in Beijing: 180 days in Beijing. 910 To Go. I am rather surprised at how quickly it has passed. Not actually true since I’ve spent time in Tanggu, on an oil rig in the Pacific Ocean, Tianjin, Shanghai, Malaysia, Sinagpore as well as Beijing. For the year or two before I came to China, I had only left America to visit Mexico. Not too exciting. Since then I have to say that my life has really been a trip. The reason I came to China is a story in itself. I was going to quit my job, as a social worker specifically working with 18-24 year old people that had been diagnosed with their first or second psychotic episode. These were mostly people that were on medical, medicare, and other social services. It was an incredible job where I was able to help my clients learn more about their diagnosis, how to master it, and help them continue their lives and not be caught in the stigma and get lost in society. I also learned a lot about myself. I had been working with geriatric clients (60 and above) for the 5 years previous to that and, as much as I loved that job, to be able to help young adults control their hallucinations and delusions, and other issues that would occur, proved to me that we have so much more power and choice in our lives and that if we desire to overcome almost anything, we can. It is why I quit that job actually. I love salsa dancing and have been dancing it for around 13 years or more. I am very intrigued by their culture. I had decided, a month before leaving the job, that I would take a year off and travel the world. I’d start in mexico to see my cousin, Michelle and her husband John, and then travel south. Eventually, I’d go to Cuba, then Europe and then end up in China and visit my older brother, Robert. Then things changed in a blink of an eye. My brother called me and told me there was a job opening at a medical center that he knows about in Beijing. I emailed over my resume, was interviewed, was hired and then had to have a full physical. I had to do an EKG and a lot of tests that I didn’t expect. This included a vision test where I learned I have 20/10 vision. I can read the smallest line at the bottom of the test easily. I also had to do a color test and see numbers that are different colors from the background. If you can’t recognize the colors, you are colorblind. Luckily, again, I have perfect vision. Every other test showed that I was healthy. The doctors doing the tests were actually quite interested in the results and the reason for the tests as they had never heard of someone having to get a major physical to go to a job overseas. They called me with the final results and congratulated me and wished me well on my journey. After getting the results, I got my visa, sold almost everything I owned (I have 5 lawyer sized boxes back in America, a large painting that my mom gave me years ago, and nothing more), taking a two week vacation to Mexico to visit my aforementioned cousin Michelle and her husband John, I bought my plane ticket, hopped on a plane and arrived in China. That was 180 days and, 180 blog posts, ago. Since I have a three year contract, that means I have roughly 910 more to go. Day 172 in Beijing: Social Media, Expatriates and Blogging. I promised to finish the post from yesterday and I like to think I’m a man of my word. As an expatriate, I believe social media is a bit of a life saver for me. I have Facebook, Twitter, WeChat and, obviously, this blog. It is a way of connecting to the world for me. Before Jill came over we would skype every night. It helped with the isolation and feeling of confusion while I was in a new place with only a few connections. I also was able to connect with my friends using social media to feel more grounded and as if wasn’t just wading into these waters without support. I think this has been a major help in my feeling more comfortable here and not having anxiety and worry about what may happen. There is a way to contact people who care about me and want me to prosper even when I feel lonely. That is a major benefit of social media: I may be lonely, but I’m not alone. This is something that I find useful when I’m feeling alone. I repeat this and realize the world is open to me if I am open to it. And, when I connect with people, I am open to it.